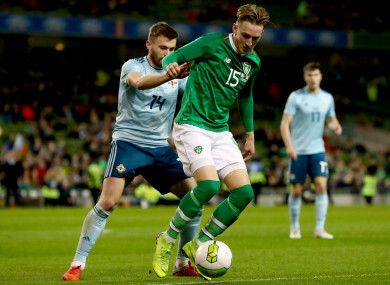 Ronan Curtis made his international debut for the Republic of Ireland on Thursday night. MATTERS ON THE pitch may not have inspired much confidence, but Thursday night’s scoreless draw between the Republic of Ireland and Northern Ireland held significance for a number of those in a green shirt. Glenn Whelan lowered the curtain on his international career after 85 appearances for his country, while Robbie Brady’s return was undoubtedly a boost for under-fire boss Martin O’Neill. But while Michael Obafemi confirmed he was “all in” to represent the Republic of Ireland, it was Ronan Curtis’s big night under the bright lights at Lansdowne Road. “It’s crazy, to be fair. It’s a brilliant stadium, the Aviva,” he said after his first appearance as a senior international. “All I wanted to do was become an international footballer. Coming from Derry City in the League of Ireland where it’s packed out at 4,000, to 45,000 here with a full house, it’s amazing. The Portsmouth forward has grafted hard over the last six months to secure an international call-up and the 22-year-old admitted he was surprised his journey to the first team had been fast-tracked. “It’s been amazing. I didn’t think I would have played as much at Portsmouth when I first went there. I thought I’d sit on the bench. “But the gaffer, Kenny Jackett, gave me my debut in the very first game, I set up the winner, and in the second game away to Blackpool I scored two. “That got my confidence flying. I went with the U21s to Kosovo, ended up scoring there, and then I ended up getting the phone call from Martin to come up and train with the boys against Poland. Standing on the touchline at the start of the second half, Curtis described the feeling that came with representing his country at senior level for the first time. My heart was beating so fast. It was just an amazing feeling. I’ve been working hard in training. As soon as the manager gave me the nod tonight, I was just buzzing. Of his performance against Michael O’Neill’s men, Curtis said he was left to feed off scraps. “No, not that many chances for the forwards. You have to graft and work hard for your chances. We’re getting there, we’re becoming better now. The focus now turns to Monday night’s game in Aarhus, where Martin O’Neill goes in search of his first win of the Nations League campaign against Denmark. Without a win in a competitive game since October 2017, Curtis is hoping to turn the tide on a run of dismal performances from the Irish squad. “I’m just here to try and help the boys and see what I can bring to the table for the lads. “We’ve lacked a bit of goals but hopefully come Monday I’ll get my [competitive] debut, maybe even a start. We’ll see. Email “'I didn't think when I left Derry six months ago that I'd be here right now'”. Feedback on “'I didn't think when I left Derry six months ago that I'd be here right now'”.